YJ Hood Louver Bare for Jeep Wrangler YJ 1987-1996. Many of the problems Jeeps and slow-moving rockcrawlers encounter on the trail are due to overheating. At slow speeds there simply is Not enough airflow through the engine compartment to keep things cool. Worse, engine compartments on Most vehicles are poorly vented, with no way for hot air (which rises) to escape from the upper areas of the engine bay. Poison Spyder Hood Louvers solve that problem by promoting proper airflow through and out of the engine compartment, while adding great looks to your Jeep. The Poison Spyder Hood Louver helps keep your engine running cool by promoting airflow through the engine compartment. Many factors can contribute to high under-hood temperatures, which can translate to higher engine coolant temperatures and overheating. Headers, slow speeds, flex fans, and the cramped spaces of the engine compartment can all contribute to increased heat and reduced airflow. This Hood Louver kit frees up airflow through the engine compartment, allowing hot air to escape and cooler air to be drawn in through the radiator, improving cooling of both the engine coolant and under-hood air. Rock-crawlers and slow-moving vehicles are especially susceptible, as slower speeds naturally result in reduced airflow. In addition to improved cooling performance, Poison Spyder Hood Louvers add great looks to your Jeep! The Poison Spyder Hood Louver looks great on any Jeep, whether it is painted to match the body color or powdercoated a contrasting color. For convenience, it is available either bare or powdercoated black. Adding to the great looks are the Spyder logo cutout and stainless steel button head cap screws used to fasten the louver to the hood. Poison Spyder Hood Louvers are crafted from quality, thick gauge aluminum sheet. They are CNC laser-cut and precision die-stamped. Packaging Hood Louvers Aluminum makes the hood louver both light weight and corrosion resistant. But its thick enough to add some rigidity to the Jeep Notoriously thin sheet metal hood, helping to reduce hood wobble at speeds. Hood Louvers are fairly easy to install but do require some drilling and cutting of your hood. Stainless steel fasteners are supplied, as well as a Full-size template with instructions for cutting the airflow holes in the hood. Because it is a one-piece design, specific for each model Jeep, installation is a quick and easy. 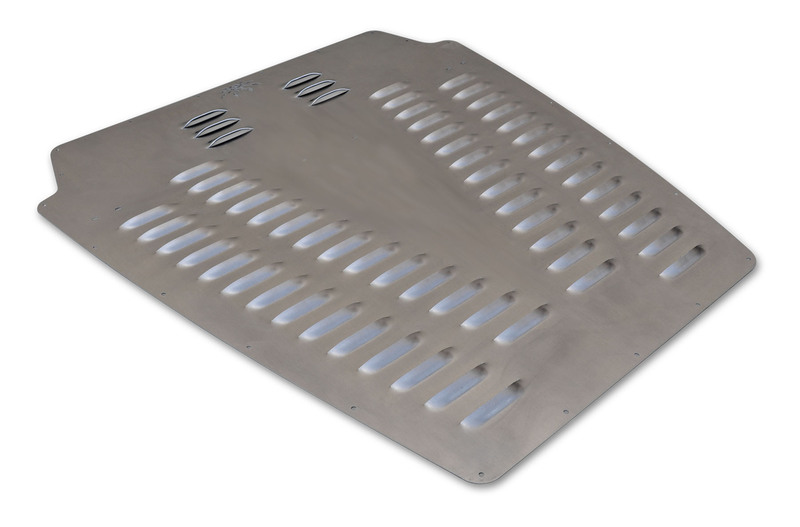 Competitor hood louver products may include multiple pieces that are painstaking to properly align and install, while others provide no cut template, leaving you to figure out how best to place the louver and cut the holes underneath. We have put almost as much engineering into the packaging as we did for the louver itself! As a rather large, unwieldy piece, it is imperative that the Hood Louver be properly packaged to ensure against shipping damage. Our custom box and CAD designed foam blocking are your best insurance against the hassles of possible shipping damage.